Welcome to Pink Petals Cattery! New Litter Born on October 15th! Phone numbers temporarily on hold. THIS CATTERY HAS BEEN TESTED AND FOUND TO BE BOTH FIP (Feline Infectious Peronitis) and FeLV (Feline Lukemia) FREE. 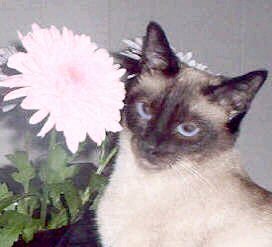 Pink Petals Cattery specializes in breeding Traditional Siamese and Traditional Balinese beginning in 2004. We primarily raise Seal Points, but our Male has Lilac in his genetic make up, so he has the potential to produce most other color points (Seal, Chocolate, and Blue Point). There’s just something about these two breeds that is so magnetic. They’re the most intelligent, beautiful, loving companions and I don’t see my life without one of my kitties (or one of their babies) in it. All of my life, I’ve loved animals. Since I was old enough to put sentences together, we always had a “zoo” growing up. This consisted of cats, dogs, fish, birds, and rodents. When I was 3 years old and someone asked me what I wanted to be when I grew up, I said a Marine Biologist! How many other 3 year olds do that? It’s always been my dream to live and work with animals, and now I get the best of both worlds – through my wonderful cattery and now going through my degree program to become a Veterinary technician, and eventually, a Veterinarian. 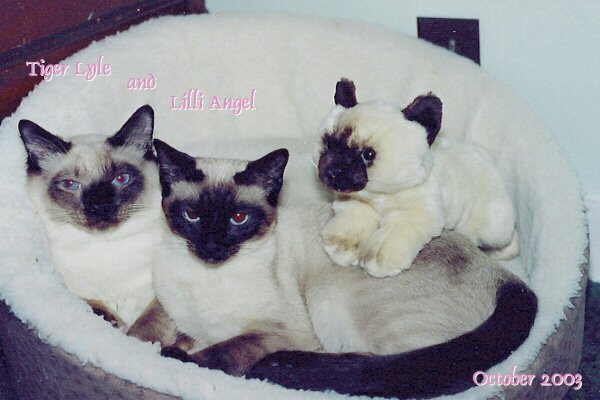 I began my adoration of the Traditional Siamese when I adopted a cute little kitten from the Anti-Cruelty Society. I named her Willow. She was like no other cat I’d owned before. She didn’t fit into the normal cat generalizations. She was like a dog in a beautiful Siamese body. When Willow passed away, it took a while to get over her loss, but after a year I decided that I wanted another Traditional Siamese. I began looking into breeders, but soon discovered that there weren’t a lot of Traditional Siamese breeders. I bought my little Lilli Angel first from Blessed Be in Ohio. We drove 8 hours to pick her up! After having her one day, it became clear to me that I wanted to be a part of promoting this amazing breed of cat. I soon bought my Tiger Lyle, and completed our little family. I feel that the people who are involved in the Traditional Cat Community are so connected, genuine and respectful people. It’s not a competitive community. We’re all just so proud of our animals and want to provide the best kittens possible. We currently do not offer shipping, as we feel it’s better if we meet the prospective owners first. No public Stud Service is offered. All of our kittens receive a Health Guarantee, their first vaccinations and are de-wormed. Health Certificates and Veterinarian Checks are included. A written Sales Contract is used. Please review this at your convenience. You can also click on the Contract Button at the left and if you have Adobe Acrobat on your system, it will be displayed. We use the Veterinarian recommended Hill's Science Diet dry food. Our babies prefer the Ocean Fish and Rice flavor. Our primary registry is The Traditional Cat Association, Inc. (TCA, INC.) I’ve only been breeding a short time, but have found that the TCA, INC. Registry is so impressive and helpful. Our kittens range from $250 to $600. Adult cats are $200 to $400. 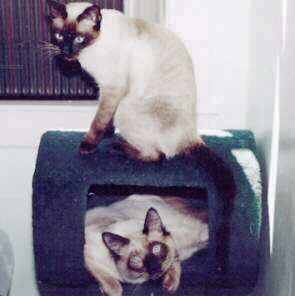 Please visit www.kittysites.com where we are listed as a Siamese breeder. Copyright 2005 All Right Reserved. Pink Petals.